During the month of sales, RESTOP will be featuring discounts through December 13, 2018 on some of its most popular products. (1888PressRelease) November 17, 2018 - With the holidays around the corner, RESTOP is making gift giving easy this year with a month-long series of shopping specials. With these deals, the company’s line of portable restrooms and accessories make great presents for hikers, campers, hunters, anglers and any other outdoor enthusiasts as well as parents and people on the go who want the ease of convenient sanitation while reducing their impact on the environment. •	RS306 Commode with Supplies: This fully-stocked commode system includes a portable base with foam toilet seat, hinged lid, four liquid waste bags and six solid and liquid waste bags for instant access to a sanitary toilet. During the sale, the price is marked down from $95 to $75. •	RS510 Commode with Supplies: Like its counterpart, the RS306, this is a complete commode system with sturdy base, comfortable seat, lid, and ten solid and liquid waste bags. Right now, the set is on sale for $70, down from $90. •	RS500 Privacy Shelter: Made of an opaque material, this sturdy, collapsible shelter affords complete privacy and folds into a convenient hands-free carrying case. It’s also available with an optional NEMO Helio shower. 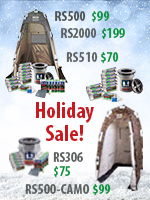 During the holiday sale, the portable shelter is just $99, regularly $125. •	RS500 CAMO: For those who want the added benefits of camouflage, this camo version of our original privacy shelter blends in with the natural surroundings. Complete with stakes and guide lines for easy set-up and a camo carrying case for transport, this shelter is just $99, marked down from $140. •	RS2000 Personal Lavatory System: This total system transforms into a complete, private bathroom with a privacy shelter, commode with seat, waste bags and shower. Right now, the set is on sale for $199, down from the regular price of $230. RESTOP’s environmentally responsible solutions provide gift givers and recipients peace of mind by enabling safe, convenient access to facilities without having to worry about harming the environment since the products effectively contain human waste and can be safely disposed of in regular trash receptacles. To take advantage of these holiday specials, the products can be purchased through the RESTOP website at www.Restop.com. RESTOP products are also available at retailers throughout the country (see www.restop.com/retailers for a current list) and at some national parks.